The lhasa apso is a small breed dog and was originally bred to be a guard dog. Today the lhaso apso is more of a companion dog breed, but it still maintains many of its guarding instincts. Although the breed is small in size, they can be aggressive and fierce when it comes to protecting their family. Generally they do not attack, but they will do their best to intimidate any unwanted guests. The lhasa apso is an intelligent dog breed, but they can be stubborn and often want to do their own thing instead of follow their owners commands. This can make it a challenging breed for novice or inexperienced dog owners. The lhasa apso is probably the most efficient guard dog in the small dog breed size category. The breed is less than a foot tall from ground to shoulder and weigh anywhere between 13-15 pounds. Their small size makes the breed easy to manage as well as a good companion for living indoors. Lhasa apsos are intelligent and independent dogs. They are happy by nature, but can turn fierce the moment they feel their family is threatened. The breed makes a good companion dogs, but they don't suffer from social anxiety if left alone which is common in other companion dog breeds. The lhasa apso is not the best dog for small children as the clumsiness and unpredictable behavior of smaller kids tends to frustrate the breed. The breed can bond with other pets, but does best when they are introduced at a younger age. 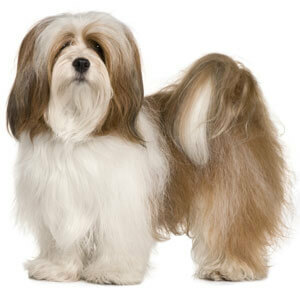 The lhasa apso has a long, straight, beautiful coat which comes in a wide variety of colors. The coat is considered high maintenance and requires daily brushing and frequent bathing to keep the coat clean and well managed. The breed requires very little daily exercise as one 20-30 minutes walk can meet their exercise requirements. The Lhasa Apso origin in not fully known since many believe they were a distinct breed around 800 A.D. wile others claim they are even more ancient (dating back to 800 B.C). Studies claim they are one of the 14 oldest domesticated dog breeds! What we do know is that they come from the small country of Tibet in central Asia. The terrain of Tibet is harsh and rugged, yet beautiful-- alternating mountains and valleys create extreme climates that range from sweltering hot to freezing cold. These "bearded lion dogs", as their original name implies, must be hardy and fierce to have thrived in such conditions. These dogs were primarily guardians. Lhasa Apso history includes guarding of monasteries and homes as well as livestock. They are said to have lived mainly on the interior of these building and alerted the monks or residents to any signs of approaching people or animals. The breed was so revered they are believed to be part of the reincarnation process of Buddhists; also, they are often associated with the Tibetan Snow Lion mythology that was thought to protect the people from the mountains. Lhasa Apso dogs could not be bought-- they were precious gifts. As such, they didn't make a well known appearance in the West until the 1900s when some military men brought them back to England. The Lhasa Terrier (as it was then referred) arrived in America in 1933 when the 13th Dalai Lama gifted a pair to C. Suydam Cutting. Although they were recognized as terriers by the AKC as early as 1935, the group was officially changed to the non sporting group in 1959. This is a small but sturdy, compact dog. The first thing you will notice is the long coat that falls along either side of the body (including the head) to the floor. 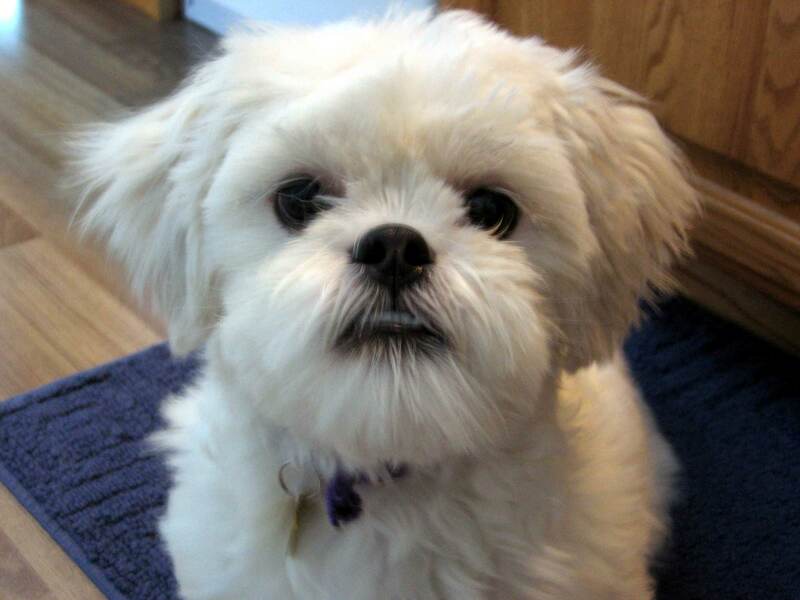 It may obscure the Lhasa's eyes dark eyes and the small black nose is framed by a beard and mustache. The hanging ears may not be easily distinguished due to the heavy feathering. The Lhasa Apso's coat type is not soft and silky like you might expect but pretty hard and thick. 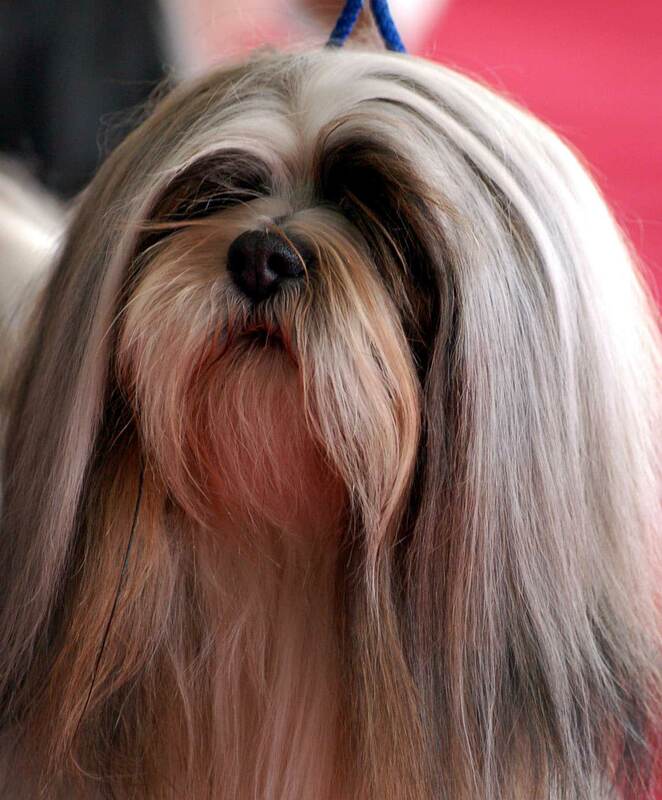 It can be almost any color including: black, white, red, golden, grey, brown, parti and so on... so we suggest consulting your local kennel club's breed standard if you plan on competing with your Lhasa. The only other notable feature of the breed's appearance is the feathered tail which is screw-shaped and held over the back. 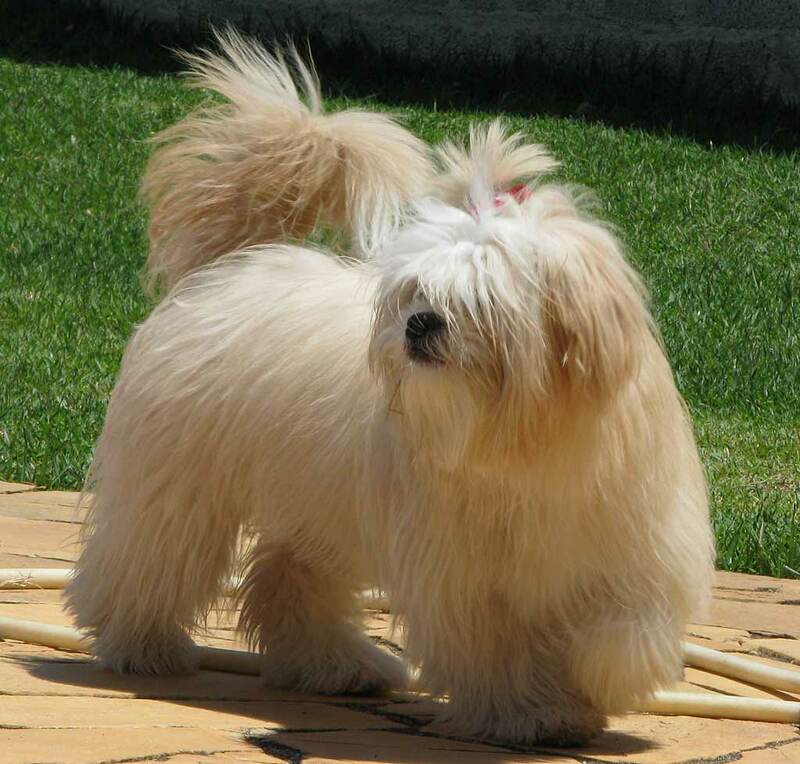 In addition to solid black or white Lhasa Apsos there are also parti individuals that are white and some other color, for example, black and white. We recommend checking the Kennel Club specific to your country for exact accepted coat colors-- the FCI allows brown and grey coats, too. Markings seen in this breed include: a black mask with black tips on the ears and beard or simply just the tips. White markings are also acceptable as are brindle and sable. Lhasa Apsos are small sized dogs but don't let the size fool you, they are capable watch dogs that are always on high alert. A fully grown one will measure 10-11 inches at the shoulder. 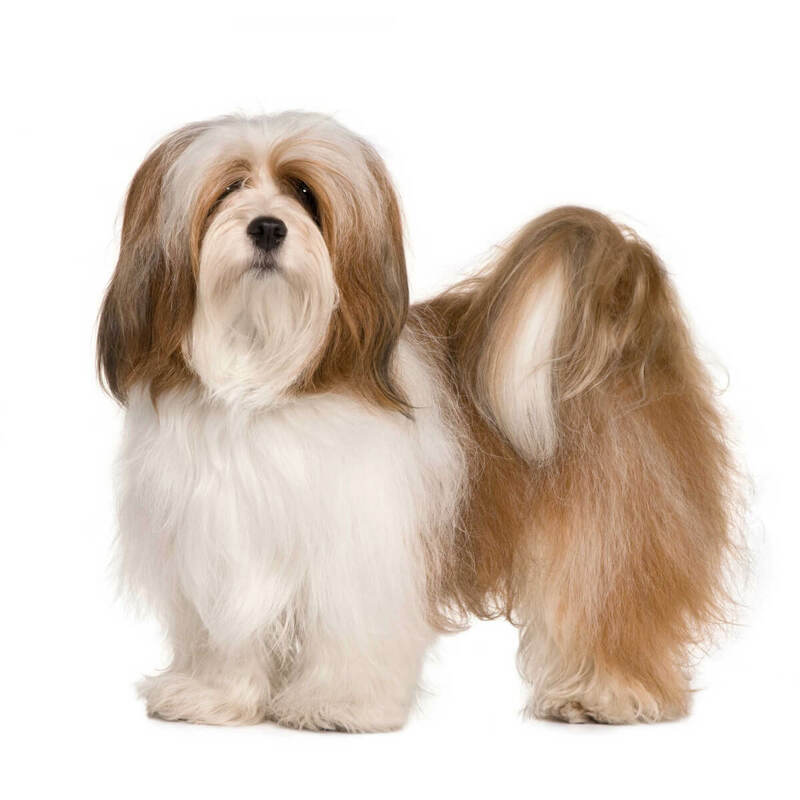 Many kennel club standard give no specific Lhasa Apso weight but somewhere between 12-18 pounds is acceptable with 13-15 pounds being most often quoted. 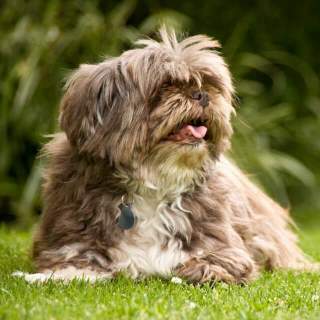 A Lhasa Apso dog breed is just that, and there are no variations. Marketing terms such as the mini Lhasa Apso, micro, toy, or teacup, or even a Lhasa Apso pequeno, miniatura, or princess type are either runts or mixed breeds. If they are runts, they will most likely be rife with health conditions and medical problems, and if they are hybrids or mixed breeds, they are simply not Lhasa Apsos. If you hear talk of variations, then people are typically discussing Lhasa haircuts for dog shows. 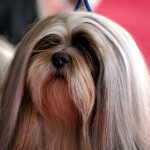 There are no short hair, long hair, or teddy bear Lhasa Apsos, just hair styles that professional dog owners prefer. The temperament of the Lhasa Apso is quite special and multi-faceted. They are certainly loving companions but are not always willing to listen or be the lap dog you expect them to be. They would rather do things with you as a partner than for you. The Lhasa Apso personality is also very lively and playful so they can make good family pets for those with older children. We stress older (age 10 and above) because they don't appreciate rambunctious rough play-- or simply being handled when they don't want to and this could result in your child being on the receiving end of a warning bite. Another notable Lhasa Apso characteristic is alertness. They may seem goofy or mischievous sometimes but, make no mistake, they are always scanning their surroundings. They are reserved and aloof around strangers but are said to also act "regal or dignified"-- we translate this as your Lhasa won't be aggressive around strangers but confident enough to know when to turn on "guard dog" mode. Early training and socialization is necessary to curb stubborn behaviors and make them less testy. Lhasa Apsos and children can coexist peacefully in the same house if the kids are older-- old enough to not play roughly, or try to force the pet to be handled when he/she doesn't want to be. These dogs are not sweet little lap dogs; they have unique temperaments that are much more likely to act as your equal than to please you. Early socialization is recommended for the best results for Lhasas intended to be family pets. Keep in mind, this is a long lived breed and if you plan on having children soon or are looking for a dog to add to a home with young kids-- consider another breed. These can save you the problems of an over eager child getting bitten and can save a Lhasa the trauma of being rehomed. The Lhasa Apsos temperament with cats and other dogs is generally good and some even describe them as a cat-like breed due to their independent and sometimes stubborn natures. This definitely depends upon how they were socialized when they were young-- some owner have 0 problems while others say their Lhasa and cat are mortal enemies. Introduce them to cats and other dogs as early as possible if you plan on having one in a multi-pet household. 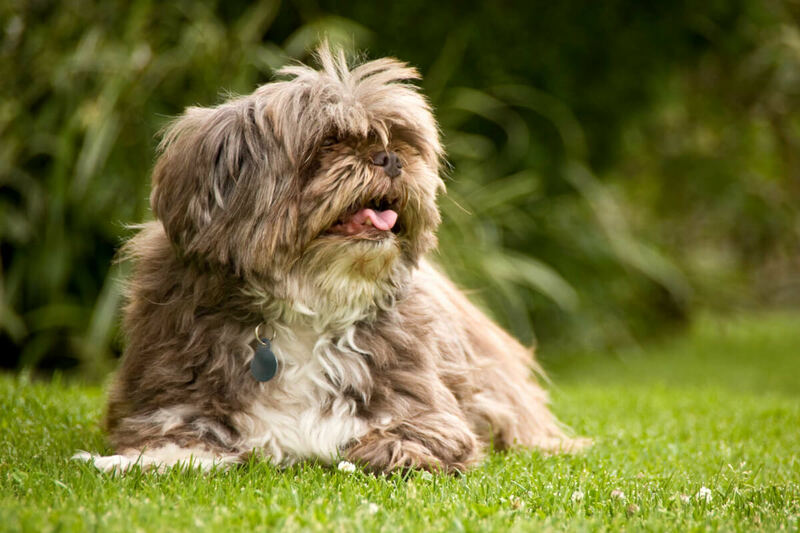 Below are pictures of the Lhasa Apso dog breed. Having a Lhasa Apso as a pet is a long responsibility. They are hardy for a small breed and the oldest one on record was 29 years old! They are indoor dogs that don't require a yard and are perfectly sized for small living spaces. They will probably be lively and spirited indoors and are always on the alert but they will still need a couple short walks per day to prevent them from becoming overweight. Some will be a bit mischievous and clownish so making sure they get plenty of attention is a priority. Lhasas should be ok while you are at work or school but are a companion breed so desire to spend as much time with you as possible. These dogs are natural watch dogs; they are not friendly towards strangers but shouldn't pose much of a threat either. Another important fact-- Lhasa Apsos are hypoallergenic, meaning they put off less allergy causing dander than many other breeds and should be a better choice for those with pet allergies. 1. Lhasas are very long lived. The median age for them is often quoted to be 13 or 14 years but they often life into their late teens. The oldest lived to be a whopping 29 years old! 2. This breed is often considered cat like due to their independent and not very "eager to please" natures. This may disappoint some looking for a lapdog carry around like a baby but, don't despair, the breed is very active and loving with the owner. 3. These dogs were actually watchdogs of buildings and homes as well as guardians for flocks and herds in Tibet-- hard to believe considering their small status. 4. They are considered to be the physical embodiment of the Tibetan "Snow Lion" which was believed to guard the people from atop the mountains. Many of these health concerns are not a major problem in the breed. 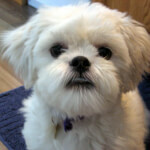 It is still important have your Lhasa dog attend all scheduled veterinary visits to detect and prevent problems.